Traversing across two major states of India and then rewinding back to Maharashtra by road was not only adventurous but also soothing at the same time. It was an unplanned road trip with friends and family, however, we managed to make a rough itinerary of how we will locate places and visit them. Our road trip was planned just to get a sight of the ‘two states’ (:D) and not majorly to cover each and every tourist spot that one can find through Google. Basically, we just hopped into tourist places that came our way and did not mainly go and visit each and every spot. As the title goes, we indeed had just planned this trip to capture the sights of these states. HIGHLIGHT OF THIS TRIP – The road trip was executed in the cold month of November. Do not forget to carry your sweatshirts when you are planning a getaway in Rajasthan during the winters. The highway (NH-8) from Maharashtra to Ahmedabad is well maintained with broad roads and proper streetlights. And you can definitely take your family along with you for a road trip and ditch the trains or the flights if you wish to have some adventures on the roads.! Our trip started at 11 pm and we took the route of NH-8 that connects Gujarat and Rajasthan from Maharashtra. It took us some 8 hours( i.e..at 7 am) from Vasai (a town on the outskirts of Mumbai) to reach our first checkpoint i.e ‘AHMEDABAD’ (Gujarat). Ahmedabad was all bright and cold in the early morning, we halted at a roadside motel to freshen up and recharge ourselves & then proceeded with the typical Gujarati breakfast that consisted of ‘Dhokla, Khaman, Undiyo, Papri, and Chaas’. (Do not miss out on any of these items if you are anywhere in Gujarat) The breakfast was really tempting. After treating ourselves with the typical Gujarati khana (food) we headed towards these spots: Vintage Car Museum, Kite Museum, Sabarmati Ashram, Sardar Vallabhai Patel Museum and Kankaria Lake (a part of my Gujarat Street Wandering Experience). As the name suggests, it's a museum that displays about 150 vintage cars, bikes and horse carriages from the Victorian era. The entry fee to this museum is INR 50/- per person and if (I know right! it’s not an ‘IF’, it’s a must- LOL!) you wish to click pictures they will cost you INR 50/- per camera.The museum is basically a semi-colonial farmhouse with different hallways that has vintage cars from popular companies like Rolls-Royce, Chevrolet, Mercedes, and various others. The best part of the museum is that you can choose the car of your own choice and take it for a 3 km drive which will cost you somewhere close to INR 500 bucks..! But isn’t that pretty cheap when you can drive a car of an era long before you were even born..?? So, this comes up to a must watch sight if you are fond of cars, even if you aren’t you can still go for it..!! The vintage car museum premises also has a farmhouse restaurant adjacent to it where you can grab a plate of kebabs! From getting back to the era when kites were first invented to the usage of kites during the Independence era, a bright colourful display of innovative kites to their various other patterns, you can have a glimpse of a brief history of just kites. As the name goes, this museum is all about kites. If you are too much interested in the concept then you will definitely enjoy the place, if not then it’s okay if you miss out on this place. The museum has a tall statue of Sardar Vallabhai Patel (one of our national leaders) at the entrance and also has some beautiful pieces of caricature lined by the premises. One can also spot an ancient fire engine of the British era in the compound. In the museum, you can enjoy the sight of some of the historical remains and also commodities belonging to Sardar Vallabhai Patel. You will also come across some of the themes of ancient Gujarat like Dresses, Wooden Doors, Utensils etc. Adjacent to this museum, there’s one more museum, however, I don’ t really remember the name, it’s a museum based on textiles. If you are a textile and a historical person you’ll always enjoy these places. To Note:- Both of these museums don’t really gather many tourists yet you can enjoy the places if you find interest in these. Please visit the above-mentioned blog link of one of my recently updated blog posts to know in detail about ‘SABARMATI ASHRAM’. The link will suffice to all of your inquisitions. This place is a must watch in the city of Ahmedabad, one cannot just afford to miss out on this. Kankaria Lake (Gujarat’s largest freshwater lake)is a must watch and a refreshment spot when you decide to toil around Ahmedabad. From its mesmerizing lakefront, amusement parks, helium balloon ride, laser show, food joints, water zorbing, speedboat ride to the Kankaria eye (Yes! that’s what it is called)..it has everything to opt for a family spot. If you are in search of some thrill in your vacation get in here.! To note- Kankaria Lake light show during the evening makes the lake way more beautiful. Do not miss out on this piece of thrill..! These were all of the spots that we captured glimpses of in the city of Ahmedabad in a day, we left Ahmedabad. (Back in 2012, I think I had already unleashed the ‘City Nomad’ in me..cool, let’s wind back to the present day, 2016..!! )After Ahmedabad, our next stop was the hill station of Mt.Abu, Rajasthan. We continued on our same old route of NH-8 and the road trip from Ahmedabad to Mt. Abu took us some 4 hours. It was freaking cold, I had to wear a layering of 2 clothes and a jacket. As we rose towards the hilltop the view was obviously worth a watch. After reaching the main market area of Mt.Abu we decided to halt by a motel and engaged ourselves with some indoor games. Waking up to the chills in our spines and hotbed tea the view from our hotel was definitely amazing with fog down the hills and streets covered by people in warm colour coats. What else could take off your breath than a misty morning by the hillside..?? Grabbing off through the rushing hours! We planned out on our itinerary for our last day in Mt. Abu; we planned to cover in spots like Guru Shikhar point, Dilwara Temple, Bordering Countries and the Headquarters of Brahmakumaris. The climate turned out to change gradually, from the cold chilling mornings it started getting warmer but wasn’t too hot, however, it wasn’t quite preferable for a trek. The trek offered a great view from the peak. You will be able to spot a temple of Lord Vishnu and can also spot the Pakistan border from the top. No matter however lazy you intend to be, don’t miss out on this spot! Tourists fond of meditation and spiritual healing can visit this place which is also popularly known as, ‘Rose Garden’. It’s the headquarters of the Brahmakumaris which is a spiritual healing organization. The atmosphere of the garden is silent and tranquil. Keep calm & Meditate..!! Couples and youngsters roaming the streets wearing 2 layering of clothes to suffice to the freezing nights and catching glimpses of the traditional Rajasthani clothes and handicrafts, bargaining and arguing over discounts so that they don’t miss out on their catch! Mt. Abu has a good taste in clothes, shoes, and handicrafts to offer to its tourists. Having been made up a mind spontaneous we decided to go boating in the lake ‘Pichola’ we traversed through the mild waters of the lake and passed by posh hotels of Taj group, The Leela, and The Oberoi group of hotels. By one of the sides of the lake ‘Pichola’ stands the tall city palace and in the middle of the lake is the ‘Jag Mandir/Palace’ which offers a panoramic view of the entire lake, on the other side stands the tall hills. Don’t miss out on the boating tour across the lake. It’s a must go for.! Another stroke of amusement was the ropeway ride to the top of the hill from where you can grab a splendid view of the Sunset and of course, the entire city. The hilltop is mounted by traditional Rajasthani architectural tombs and pillars with wide lawns. This a spot-on tourist attraction. A must visit..! P.S:- We missed out on the ‘City Palace’ since it was shut down by the time we reached. But one shouldn’t miss out on the beauty it offers. It offers a shopping spree to the shopaholics. You can go store hopping to get a pair of boho sandals to accessories, leather goodies and not to forget- their traditional attire (Ghagra Choli) the ones most popular are with the mirror work on it. Go get a pair of these in vibrant purple and blue hues.! (Because those look the most attractive). A Goodbye Promise of getting back there! Waving a Goodbye to the state of Rajasthan, we headed towards ‘Kutch’ (Gujarat) one of the arid areas of Western part of India. Udaipur to Kutch was a pretty long trip by road and it was a continuous journey with just short halts. It was an 8hr long trip. Somewhere in the mid-morning, we reached the small village of Mandvi, Kutch. Tapered with low height open house terraces and small balconies, Kutch couldn’t be any simpler in its decor, however, the roads were really bad and life was tough in the drylands. Since, that was our last stop on the road trip we had planned a night’s stay in one of the Kutchi houses, accompanied by the locales. The climate was in stark contrast to that of Mt. Abu and Udaipur. Kutch was a little bit on the heated side with sands on the roads and not many people to populate the village. We covered some of the destinations out there like, The Vijay Villas Palace, The Mundra Port, and the nearby town of Anjar. Surrounded by lush green scapes and old mansions by the lanes stands the beautiful ‘Vijay Vilas Palace’ with open terraces and swirling staircases across the dark corridors and the gothic innovators. 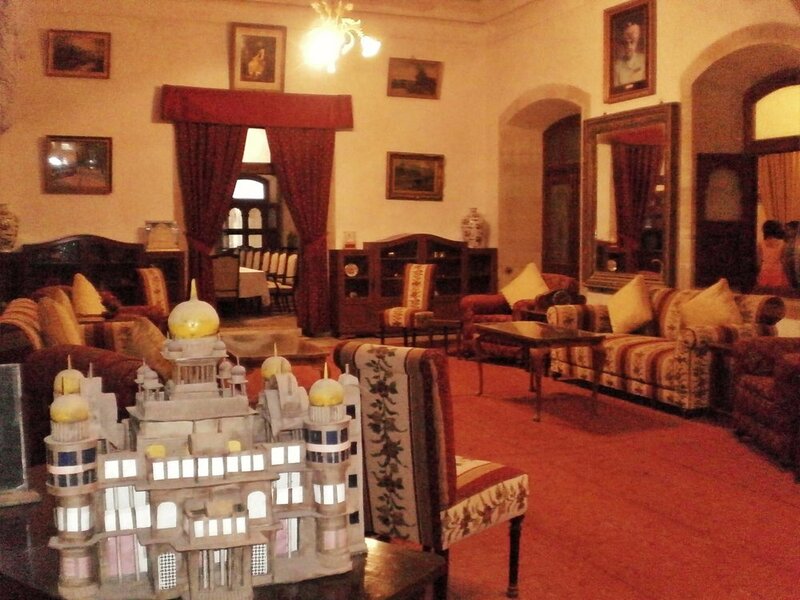 Having a blend of the colonial and desi infrastructure this palace will take your breath away. It has been a popular site for the hit Bollywood film, “Hum Dil De Chuke Sanam”. Sporting a museum within its premises you will love to stroll around the backyards or should I say ‘jungles’? (lush green jungles..). Tourists who would like to know about the trading from the ports can definitely visit this place. However, you need to have a permit to get in here, a locale would probably come in handy. This is a thumbs-up for the Kutch Tourism. Photography wasn’t permitted. Heartthrobs of traditional Bandini (a handprint textile of Gujarat) lehengas, saris, and other Indian stuff can definitely stop by and go gaga shopping in the most reasonable rates that you could ever treat yourself with. Due to the not so cold-not so hot weather in the sparse region of Kutch, we had to totally rely on a simple staple Indian diet of rice, dal and a vegetable curry with chaas. The food was simple in our two-day homestay and the people were just as simple as the town of Mandvi, with little resources and a colony of few houses with sparsely populated villages they find out a way to be happy unlike the people in big posh cities. While the sun rose to the next morning calm we drove off by the villages and the road back from Kutch to that of Vasai is a long 850km journey which took us more than half a day to reach our desired destination. On our way, we witnessed beautiful villages with tiny houses and shepherds with their flock of sheep and not to forget the beautiful sunset..! Luckily this trip was just for capturing glimpses, otherwise, there’s a lot more to explore in the streets of Gujarat and Rajasthan..no wonder I’ll be definitely getting back to greet the locals with ‘Khammagani’ & ‘Jai Shri Krishna’. What was your share of travel experience in Gujarat & Rajasthan? Well, you can also keep a track of all my travel updates on Facebook, and Instagram.